No matter what your group’s size, our staff can design a custom tent or trackside chalet package to accommodate your needs AND budget! Hospitality client must use designated caterer/vendor in hospitality areas. 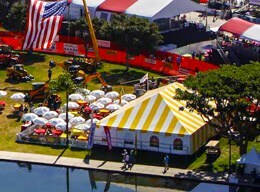 All hospitality tents have common portable restroom facilities. To purchase parking, please refer to information contained on the ticket page, or call toll-free, (888) 827-7333. Download a convenient hospitality order form here.